“Jacob Bernstein’s documentary about his mother, Nora Ephron, is unbearably funny for much of the way, and then it is sad, but bearably so because Everything is Copy is about one woman’s realisation that some things in life are more than material for her writing … Over the course of the 90-minute film, we come to understand how Ephron cannibalised her experiences and observations not only for her work as a writer and film director, but also as a way of shaping her public persona.” — San Francisco Chronicle. “There’s tartness here, too, as the movie’s guests — including Ephron’s three sisters, two ex-husbands and a chorus of Hollywood luminaries and New York literati — honour her sometimes lacerating candor with a dollop of their own. In particular, a tantalising segment with the director’s father, the journalist Carl Bernstein, casts a slightly different light on the painful divorce that Ephron seemingly laid bare in her novel-turned-movie, Heartburn (1986). Digging into the psychological space between her wildly public life and intensely private death, Everything is Copy is a pickle slathered in whipped cream. Just like its subject.” — New York Times. 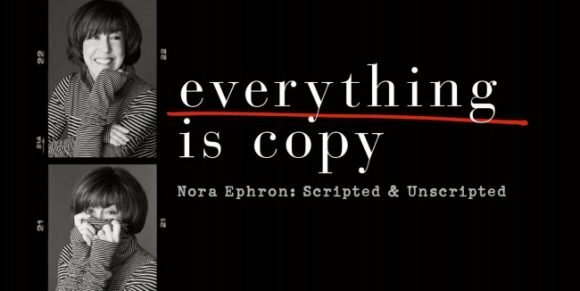 “The most affecting portion of Everything is Copy concerns Ephron’s illness that led to her death at age 71. The film’s title proves ironic, as Ephron, who mined every aspect of her life for material, kept her fatal condition a secret from practically everyone, including almost all those closest to her … Her decision to remain mum merely adds another level of complexity to a supremely talented woman who — judging by the tears freely flowing in the film — was as loved as she was admired.” — The Hollywood Reporter. “Anything but a morose tale of a bright light snuffed out far too soon, Bernstein’s documentary is an inspiring heartstring-tugger. Buoyed by proficient non-fiction techniques, it nimbly captures, in both words and images, the spirit of Ephron: a larger-than-life force of nature whose triumphs were born from her unapologetic embrace of ambition, and from her shrewd recognition that honesty, whether sweet or scathing, always goes down better with a dose of humour.” — Variety. The Night Of the Next True Detective?